Chancellor Don Straney stands with three of this year’s Alumni & Friends scholarship recipients. (l-r) Lissa Tsutsumi, Chancellor Straney, Jodie Schulten, Holo Ho‘opai, and Yu Yok Pearring, director of marketing and alumni. Missing is scholarship recipient Melissa Sullivan. 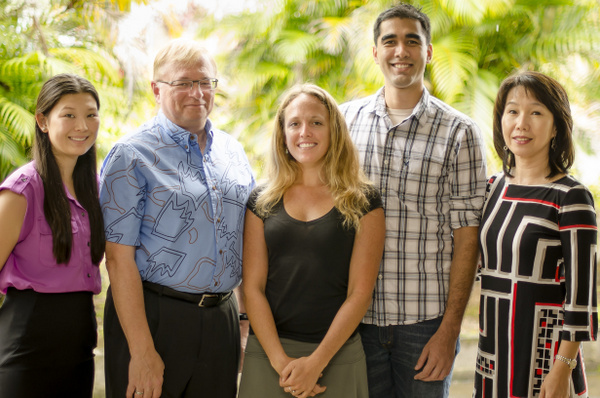 The University of Hawai‘i at Hilo Alumni and Friends Association recently announced this year’s recipients of its annual scholarships. Holo Ho‘opai, Jodie Schulten, Melissa Sullivan and Lissa Tsutsumi will each receive a $1,500 scholarship. Selections are based on academic merit and financial need. Applicants must also be or have an immediate family member who is a UH Hilo alumnus. Holo Ho‘opai graduated from Hilo High School and is a former student of Ke Kula O Nāwahīokalani‘ōpu‘u Hawaiian-language immersion school. He is seeking a degree in Hawaiian language and literature. After receiving his graduate degree, he intends to further advance in higher education by either seeking admission into a doctoral program or law school. Jodie Schulten is a graduate of Bear Creek High School in Colorado. She is seeking a Master of Science in Tropical Conservation Biology and Environmental Sciences. Her passion to preserve the native species of Hawai‘i’s lowland wet forests will be the driving force for anything she does after graduation. Melissa Sullivan is a graduate of Pahoa High School. 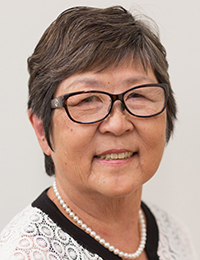 In 2007, she received a Bachelor of Science in Nursing and is in the first class of UH Hilo’s new Doctorate of Nursing Practice program, which launched this fall. She hopes to come back one day to return this great experience as a university educator. Lissa Tsutsumi is a graduate of Hilo High School. She is currently a senior at UH Hilo. Her goal is to pursue a career of formulating the next generation of pharmaceuticals and cosmeceuticals. For information about supporting the association’s scholarship program, call the Alumni Office at (808) 974-7501 or visit hilo.hawaii.edu/alumni/scholarship.php. Welcome to our new academic year at UH Hilo. The beginning of the school year offers an exciting beginning for all of us. I am delighted to share with you some great news from UH Hilo’s College of Business and Economics. CoBE and the students in the college recently received high scores from the nationwide Collegiate Learning Assessment. The CLA is a national instrument that evaluates students’ written responses to assess critical thinking, reasoning, problem solving skills, and their ability to communicate clearly and cogently. Our student achievements were significantly above the national mean. Thirty-three graduating seniors enrolled in the capstone strategic planning course attained an average overall CLA score of 1,189, which puts our seniors in the 57thpercentile of graduating seniors nationwide. Better still, the CoBE’s Value-Added Score among the hundreds of institutions that administer the CLA is at the 93rd percentile nationwide! Faculty at the college attribute this positive outcome to several factors: high quality faculty with terminal degrees who teach and are also active researchers devoted to student learning; small class sizes that allow personal attention and high levels of interaction; a strong culture of professionalism at the college; and applied learning activities such as internships, consulting for local businesses, and case and business plan competitions. Shaun McKim (2012), a double major in economics and political science, currently enrolled in Clark University’s MBA program on a merit scholarship and says the “rigorous curriculum” and the opportunity to collaborate with professors and present papers at international conferences prepared him for the challenges of graduate school.